Hundreds of people crowded into West Edmonton Mall on Tuesday night to take part in a peaceful protest against the federal government's latest omnibus bill that First Nations say violates their treaty rights. 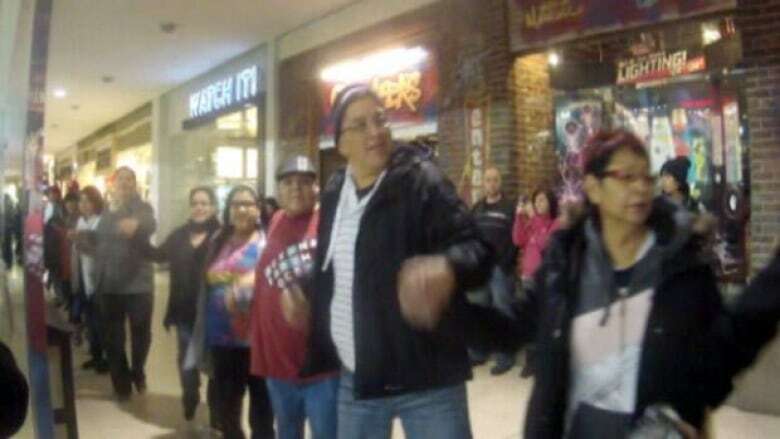 Hundreds of people crowded into West Edmonton Mall on Tuesday night to take part in a peaceful protest against the latest omnibus bill that First Nations say violates their treaty rights. People held hands and performed a traditional round dance around the mega-mall's indoor lake that holds the full-sized model of the Santa Maria ship. The rally was the latest event organized by Idle No More, a national movement protesting the federal government's Bill C-45, which contains changes to the Indian Act and the Navigable Waters Protection Act that affect land and water. "It's basically an assault on First Nations people," said protester Conway Kootenay. "And we have to address these things and the public needs to know." Over the past couple of weeks, dozens of Idle No More protests have taken place across the country, including one in Edmonton's Churchill Square on Dec. 10th. Protesters say they are hoping for change. "You know, I was very proud to be here today," John Thomas said. "To see our people come together, native and non-native, to witness this in a peaceful manner. It was a good day today." Idle No More organizers are planning more events in Edmonton. They plan to march from Kinsmen Park to Churchill Square on Friday.